Truly a great post, Matthew! I believe that the bulk of the clamor for “more professionalism” that emanates from agents is mostly self-serving gibberish. A person gets into real estate and then observes that the public does not tend to hold Realtors in extremely high regard. 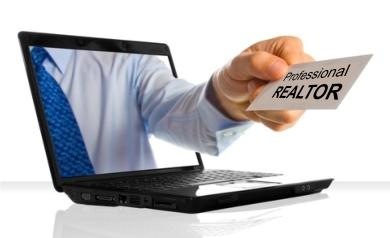 Personally, they want to be held in extremely high regard but can’t really see how they can differentiate themselves in the eyes of the public from all the other Realtors – so naturally, establish how “professional” they are by endlessly talking about how “unprofessional” some other Realtors are. All the while, without once ever bothering to even trying to define “professionalism”. You hit the nail on the head here with regard to more education: lawyers, for example, are all “highly educated” and yet are not much more highly regarded than Realtors. Why? Professions that are “highly regarded” tend to be professions where the advice being given is *exclusively* for the benefit of the public or the person receiving that advice: a librarian, for example. The librarian’s personal biases and preferences may well be part of their recommendations – but few people would suggest that certain books get recommended for reading so the librarian can get extra money. The same “high regard” holds true for professions like nursing but tends to fall off a bit when it comes to physicians (they *are* sometimes thought of as money motivated). We are all salespeople and therefore will always be – rightly – regarded by the public as salespeople. Some of us are quite “professional” at selling, some aren’t. No set of rules or regulations is going to cause people who have low or questionable morals to suddenly act right. Enforcement alone does that. What would have to change is the complaint procedure – so that agents (who are in a *much* better position to observe wrongdoing) can easily, and in a very short amount of time, file a complaint (sort of like calling 911). Then the investigation and enforcement unit would have to be able to actually look – instantly dismiss complaints without merit or grudge motivated complaints – and take swift action. In short, we would have *real* justice. As we don’t have such a thing (real justice) anywhere else in our society – in this country or any other – I’m not holding my breath waiting on that one. The most effective thing one can do is to BE the change they hope to see in others. That isn’t an original thought of mine. But I don’t know a better one. Bank of America is to be Highly Commended for their complete willingness to give so many intellectually challenged people jobs as executives. Sure, year in – year out, most other banks have always been willing to hire a few people who couldn’t think straight. But those other banks aren’t getting any awards for what they did for one simple reason: what they did was so darn common. 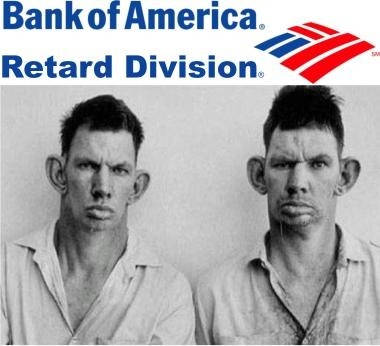 Now any buzz kill who cares to can go look and find some other division of Bank of America / Countrywide that isn’t being run totally by retards (for example, their REO loss mitigation department). But I challenge anyone to find any other bank that even comes close to Bank of America / Countrywide’s short sale loss mitigation departments for non-stop, over the top policies and procedures that make life difficult, impossible or at least a lot less profitable for the following four groups (not listed in their order of importance and there may well be others). If B of A is in a 2nd lien position, oddly enough they have workable policies in place (seller IS going to sign a note prior to close to pay the bank a small part of what they owe). They don’t flex on this issue but it is a knowable and not completely unfair rule. If they are in 1st lien position their standard and unvarying behavior (if that behavior were being attributed to an individual person) is nothing short of psychotic or completely retarded – at least down at the imbecile level. No rational judgement, no possibility at all of dealing with them the same way we deal with all the other banks on short sales. Other than limited personal – and for the most part, completely anecdotal data, most agents doing short sales on the buy or the sell side have a very odd picture of the overall scene. Loads and loads of mostly worthless gibberish. Notice how Chase and Wells Fargo are grouped in the same category as Bank of America? Wells does not ever pay any of the buyer’s closing costs and won’t pay for a home warranty. But ….. you can routinely close an escrow from start to finish with Wells in about 30 days. Actually close, it takes less then two weeks to get an approval. Same with Chase. Try that with B of A / Countrywide (who collectively have about half of all problem loans in the U.S.) It takes a minimum of 90 days to get any response back from B of A. And if you send them anything after submitting the original package (anything, even a better offer) that 90 day clock is reset. So, with B of A four to five months to actually close a transaction is not uncommon. Arizona is one of ten states that have “anti-deficiency protection” due to the nature of how foreclosure works here – it takes only 90 days from the time the lender files for a Trustee’s Sale for them to take the house back. Therefore, the anti-deficiency protection (very basic rules – there are others: The same purchase money loan is still on the property, e.g., they never took any money out of the house via a refi and it was a residential property of 2.5 acres or less). The response from B of A above was on a transaction where our seller would have no possible liability of any kind if the bank were to foreclose. None. In this case there was precisely nothing they could legally do to go after him and yet, even after being told this and being asked to please verify it with their legal department, they were not willing to budge – forcing the seller to let them foreclose. They get a house back that they really don’t want for many reasons, a neighborhood winds up with an abandoned home that will invariably sell for less money after the bank gets it back and so it goes. It is as though a complete division of Bank of America executives went looking and anything they found that could slow down the process, make it more difficult for everybody involved or simply thwart the actual goal completely – they carefully noted what that was and then adopted it as firm policy. I’m impressed. You are currently browsing the Number 1 Home Agent blog archives for September, 2009.